The recommended replacement is the OW-IO-DIO8. CRC16 Error Checking On All I/O. As many as 100 devices, (100 BBC modules). Up to 1000+ Feet from interface adapter. The GP1 Counter is designed to count and maintain switch closure pulse outputs from dry contact devices such as relays and magnetic reed switches. A battery backed 32-bit counter which can be read but cannot be reset accumulates the pulse count. The GP1 Counter provides the necessary switch excitation voltage so that no external power source is required. A cable provides electrical connection to the 1-Wire network. The output of this sensor is digital, all data conversions are done internally. Therefore, distance to the sensor is unimportant for data integrity and it may be placed up to 1000 feet from the interfce adapter. In addition all I/O and data communications with the sensor are CRC16 error checked for accuracy. The GP1 Counter has a built-in a Battery backed counter (DS2423) which provides two unique 64 bit registration numbers (8-bit family code + 48 bit serial number + 8 bit CRC) assuring error-free selection and absolute identity; no two parts are alike. Unique addressing allows I/O function to be identified absolutely, no more dip switch address confusion. 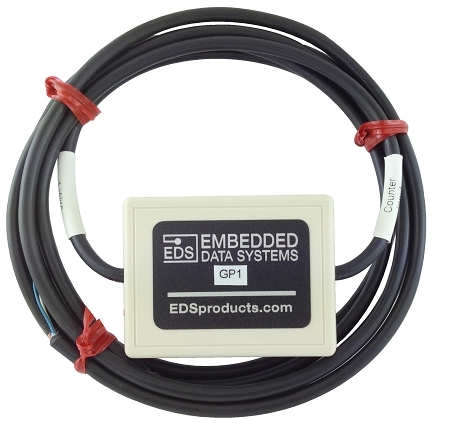 GP1 Counter requires an 1-Wire host adapter such as the EDS HA3, HA4, or HA7Net.